This is the very first unit for my new army - Tzeentch Warhounds. Tzeentch colours are traditionally blue and purple, but I had also come across a mention in the army book of warhounds in the northern wastes whose manes were made of fire. I had to try that, as the orangey reds would balance out the darker blues and purples I had in mind. So these dogs had their forequarters done in purple, blending to blue for their hindquarters. The flaming manes (after much trial and error) started as bright yellow, with successively darker washes very carefully added in oranges and reds, as I moved forwards. Then I topped this off with silver spikes and gold eyes, trying to maximise their "otherworldly" effect. As luck would have it, I had this awesome hard-foam barricade in the terrain box, so I carefully divided that into 6 pieces, and pinned each of the hounds to look as though they're leaping over the wall. And here comes the first of my Dragon Ogres!! As I type this, GW's new (larger) plastic dragon ogre models have just gone on sale, but I'm sticking with these classic models. I've got 4 of these heavy metal buggers, and although they all have the same basic pose, I've converted each one to be slightly more unique. This is the first of them, and also the least converted. The only converted parts of this one are the weapon (axe > hammer), left hand (fist > giant's slab), gnarly beard (ogre & greenstuff) and some random armour bits. Although the unit champion will be very Tzeentch-themed, I decided to paint this one in traditional dragon ogre colours - green body with silver armour. I added Forgeworld's orange rust weathering powder around the hammer head, but none around the armour - I think he'd take better care of his armour than his club (because he probably breaks those quite often!). I'm really looking forward to having a complete unit of these big guys on the table soon! I was very keen to see these guys completed, so I started with the 3 remaining dragon ogres. Having done a weapon swap on the first dragon ogre I had extra axe blades available, so this guy received a double-headed axe. I pimped him up with a few extra skull ornaments, and gave him the honorary position as the unit gaoler. The guy in the cage being dragged along is a foolish Bretonnian questing knight, who wasn't entirely successful in his quest to rid the realm of these bunch of fearsome dragon ogres. I thought it would appeal to their sense of humour to keep him prisoner rather than (immediately) eat him. I painted his head cloth as a coif of knightly chainmail, and gave him some lovely stained longjohns! 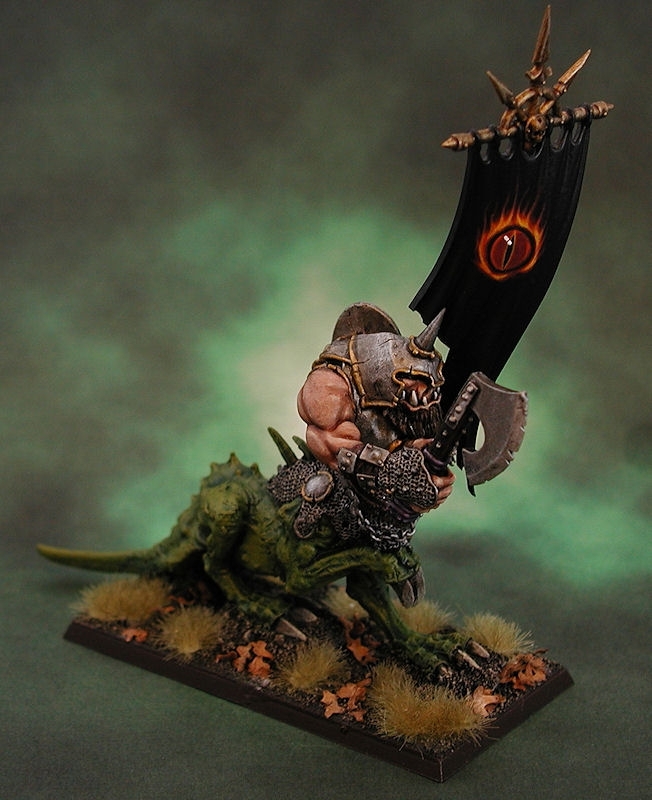 The third dragon ogre would be the unit's standard bearer (even though they can't actually take one). For this guy, I used a couple of plastic ogre arms from the club bits box and gave him bare upper arms. This allowed me to point one of his arms forwards, which made a nice change. The hand with the axe is still the original model's fist. Another cheesy beard plus some greenstuff made him the young pup of the unit. I'm quite proud of the flaming eye banner, which would become a recurring theme for all of the army's banners. And finally we have the unit champion. I wanted something a bit special for this guy, so he has been converted quite a bit. First, I removed the rather static front feet and replaced them with some random dragon claws, which gave him a much bigger and more fearsome stance. His left arm was swapped for an ogre's ironfist, and the right hand was equipped with an extended big stabba from the savage orc box set. This makes a truly massive and crude-looking spear, which I painted with an ancient meteoric iron speartip - all the better for attracting the lightning storms that seem to follow these guys around. Lastly, I swapped out the normal helmeted head for the considerably larger chaos giant's head. 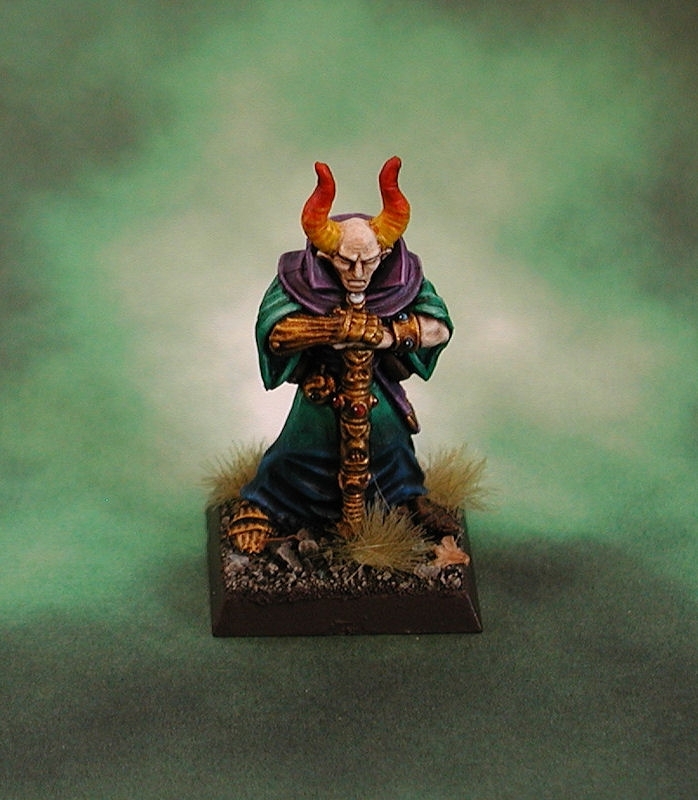 His open eye (not visible in this photo) was painted as a blood red gem, while the rest of him was painted in the blue-purple gradient to mark him out as gifted by Tzeentch. By this time I had done a test colour scheme for one chaos warrior, so I painted this guy's armour to match the black and gold chaos armour of my army's elite warriors. 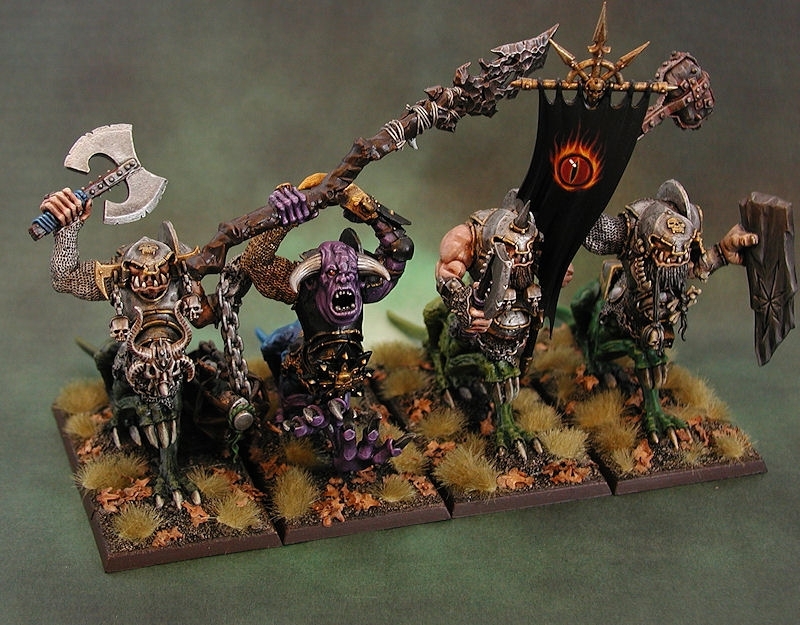 Together, this unit of 4 dragon ogres is very heavy, and satisfyingly intimidating to face across the battlefield. 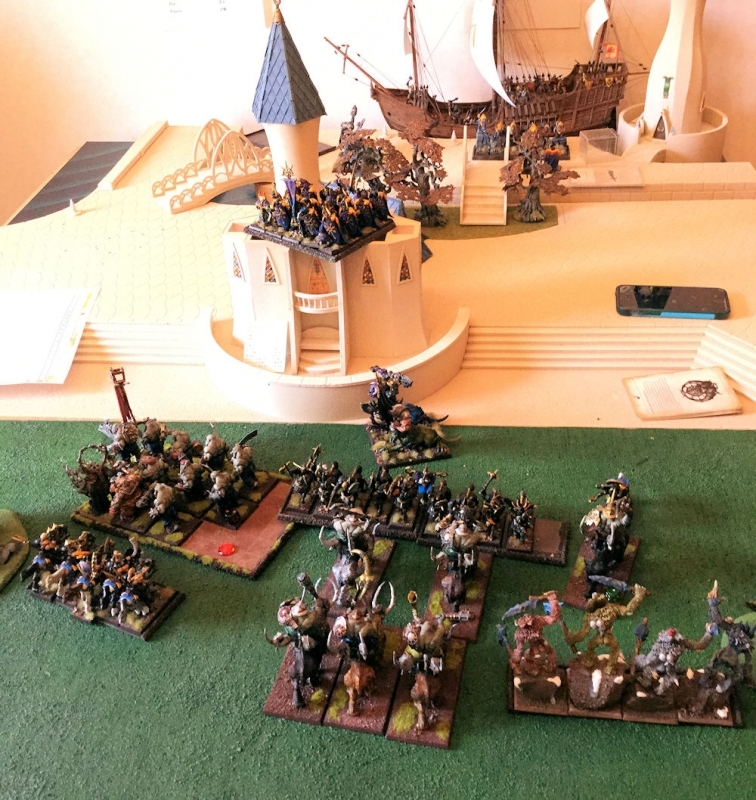 To help matters, in their first proper debut game, the other club players were able to watch them flank charge a unit of ogre bulls and utterly wipe them out. So now that they have such a terrifying reputation, they will probably be priority targets in every game they play! Next up on the paint desk was this small unit of fast cavalry. All equipped with flails and javelins, their job is to harass the enemy and strike if given the opportunity. Sadly, in the three games they've played so far, they've died or run away pretty early on in every game. Ah well. With so much exposed horse flesh on these models, I took some time to research real-world horses. So they all have reasonably convincing flesh tones, plus occasional white 'socks' on their legs and stars on their foreheads. My favourite is probably the piebald that the musician is riding. 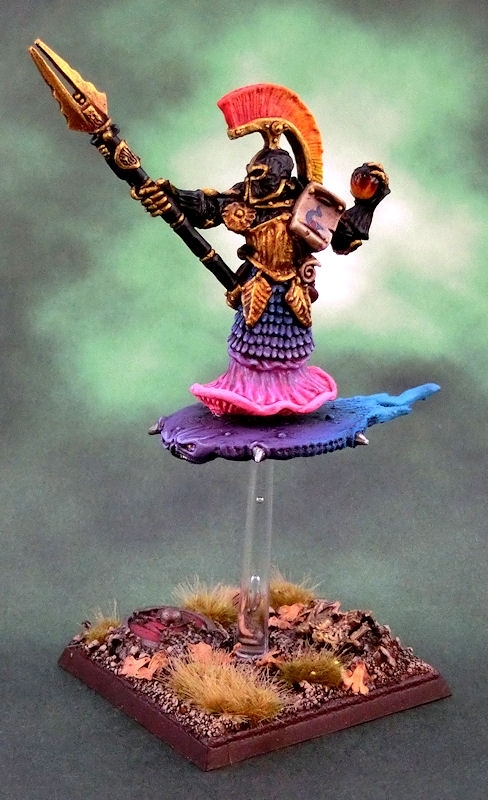 Since this unit is probably not very highly favoured by Tzeentch they only get saddlecloths in the army theme of blue-purple, but they still get all their metallics done in gold (widely available in the chaos wastes, yes?!) and armour in black. 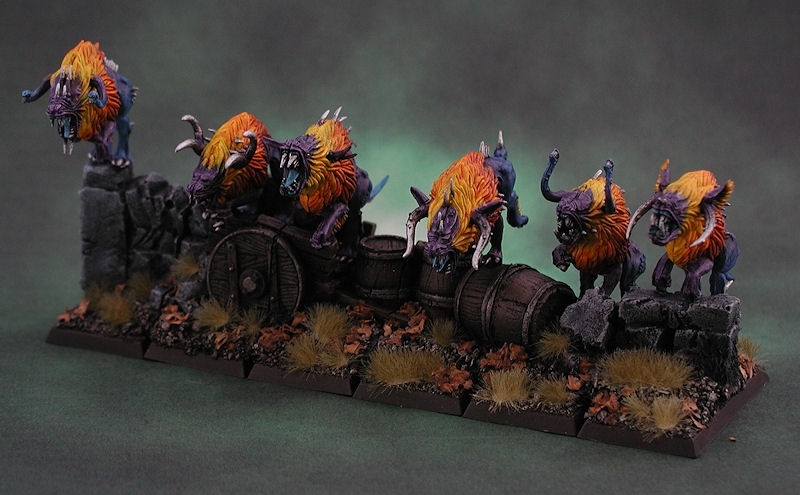 The models also get some fire-coloured warhound fur to keep those saddle-sores at bay! 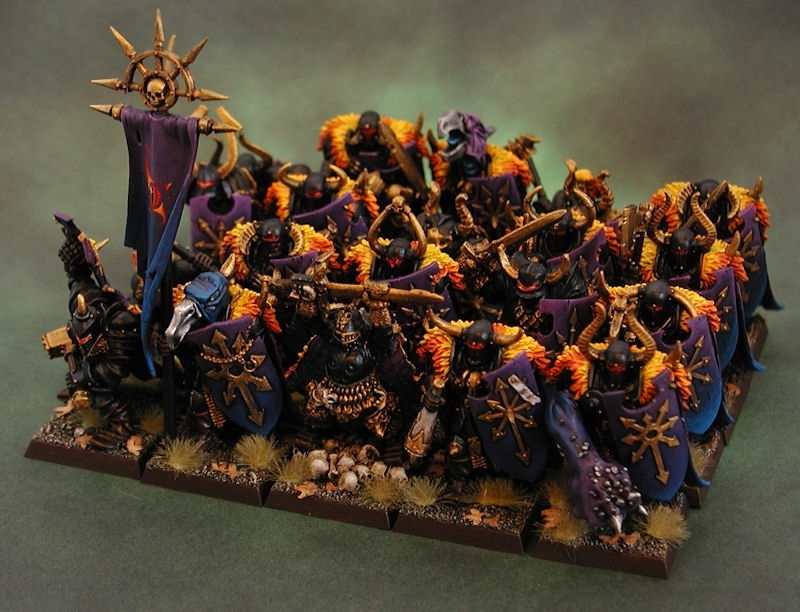 Next we have the main combat unit of the army - 20 chaos warriors of Tzeentch, with fiery shoulder furs and an abundance of cloaks. Assembling 20 almost identical plastic models is really dull, so I mixed in 8 excellent old-school metal models and a smattering of metal bits. The most obvious are the two bird headed warriors (taken from an old two-headed greater daemon) and the huge troll-fisted arm in the front row. From the back (hopefully a sight few opponents will ever see) this unit is truly Tzeentchy! While their armour is a very sombre black trimmed in gold, they can't help showing off their cloaks taken from fiery warhounds, and all featuring that eyecatching blue-purple gradient. It was certainly a little tiring to do the gradient so many times (and the blends are perhaps a little rough), but the overall effect is awesome. Love seeing these guys on the tabletop! And as a special treat for all you long-time players, here are the best of the unit's old-school models, painted to match! Everybody seems to love the pose of the hammer guy on the left, so he always gets placed in the front rank. My other favourite is the champion model (centre), which actually has his base tab stamped with "CHAOS LORD". Poor guy, he used to be the official weapon skill 9 lord model of the chaos range, and now he's been relegated to the unit champion. It's a nice model, but so short that it looked very odd next to the much larger modern plastic warriors, so he got boosted up on a big pile of skulls. Each model in the unit got a very sinister red glow painted around the eyeholes of their helmets, which adds a strong focus point to each model. Only one unit (and the army's general) remained unpainted, so I pushed on quickly to the full 1600 points. Chaos Knights!! This was going to be a large unit of very expensive chaos knights, and I wanted to do something a bit different from the normal plastic box set. Instead, I ordered 10 plastic horse bodies from the Empire range, and converted these chaos knight centaurs from a variety of old metal knight and warrior models. The theme is that these knights were originally proud Empire knights, who became enslaved to the service of Tzeentch, and warped into shapes more pleasing to their new god. The old metal models' torsoes fitted reasonably well into the necks of the empire horses, and I was able to cover over the joins with an assortment of shoulder plates, orcy spikes and other bits. 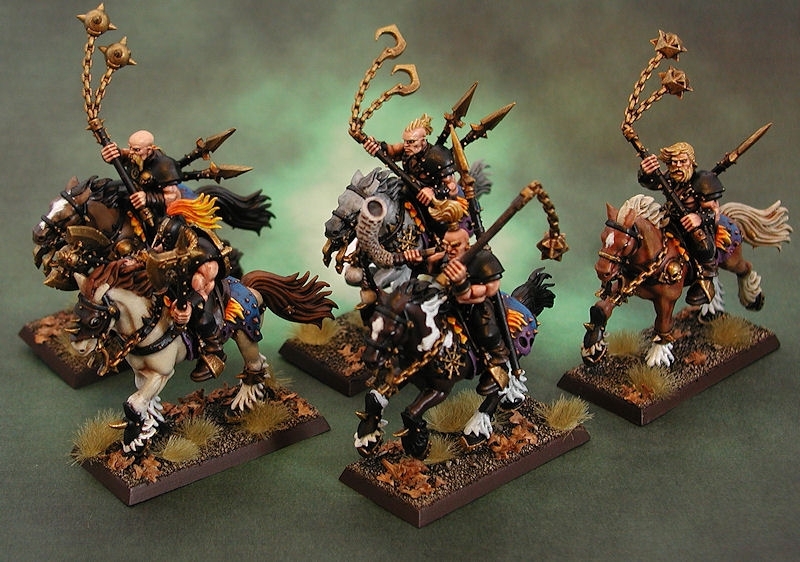 All of these models received extra skull fetishes, gold chains, spikes and even bits of Lustrian gold. Finally, I also added a modern plastic shield to each one, from the chaos marauder models. The paint sheme was fairly simple, but very time consuming. 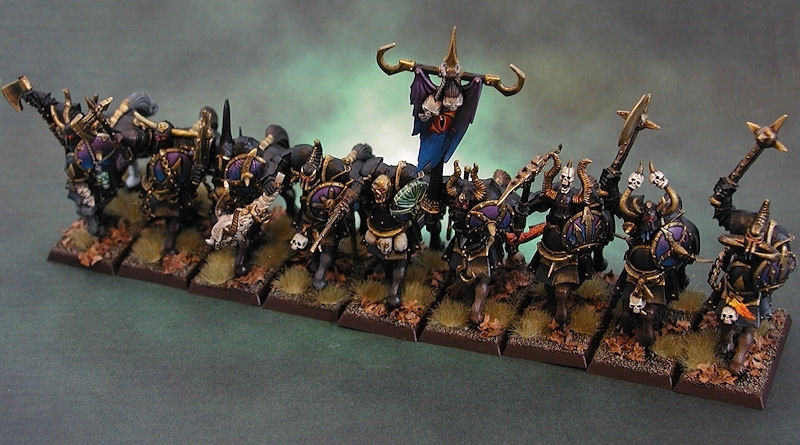 Plain black armour panels with gold trim made sure that they matched the other warrior units, and they also gained saddle cloths in the blue-purple gradient favoured by Tzeentch. 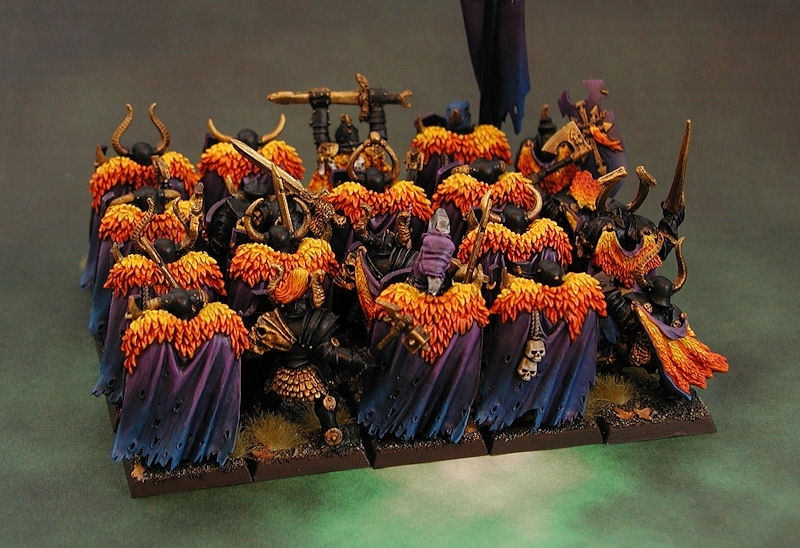 Only one or two of the models got the garish fire-coloured cloaks and feathers. Crikey - that must be heavy, eh?! 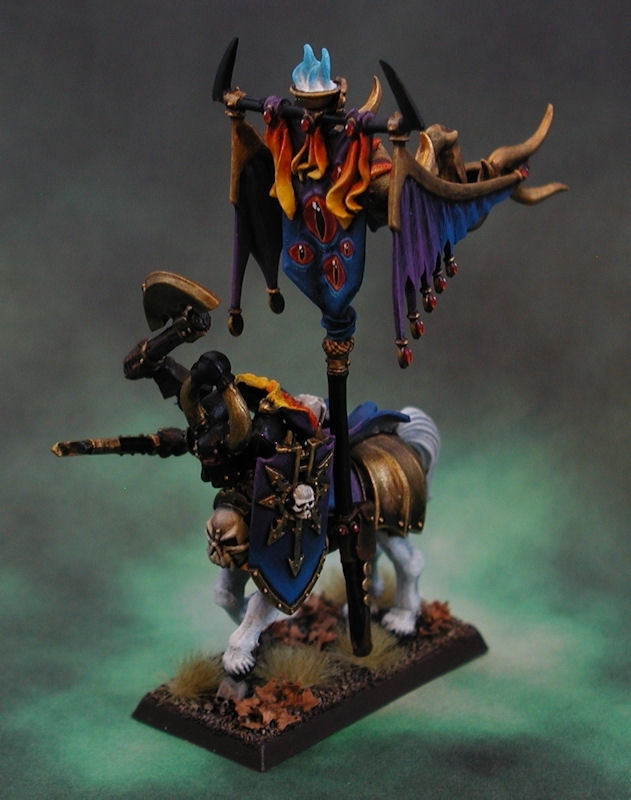 This guy received an extra arm (holding a second axe) as a blessing from Tzeentch, and is marked out with his clean white horse body, full fiery cloak, ornate shield and gleaming gold horse armour. I drilled a small hole in his side and inserted a small nail, then attached a strong magnet in the banner pole - all of which means that the banner is detachable, for when I don't want to use him as a battle standard bearer. What do you think of the banner? It was the most ornate and over-the-top thing I could create - suitable Tzeentchian! The banner pole is an old metal wood elf accessory, with the old metal high elf phoenix guard flag at the top. I reversed the flag, because I wanted the fantastic ribbons to the front, and stuck a huge lizardman serpent body totem to the back, and then joined the whole thing together with high elf dragon pennants on the side. Seeing it all painted, I probably should have sculpted on more pronounced eyeball shapes for the standard's front, but never mind. It's suitably unsettling. The last model I needed to complete the 1600 points was this chaos sorceror, who would act as my (regularly exploding) army general. Love this old school model! Nobody notices, but he's actually got two left feet! I gave him a slightly different colour gradient than the rest of the army for his cloak, going from blue to sea green, and then used purple for his shawl. 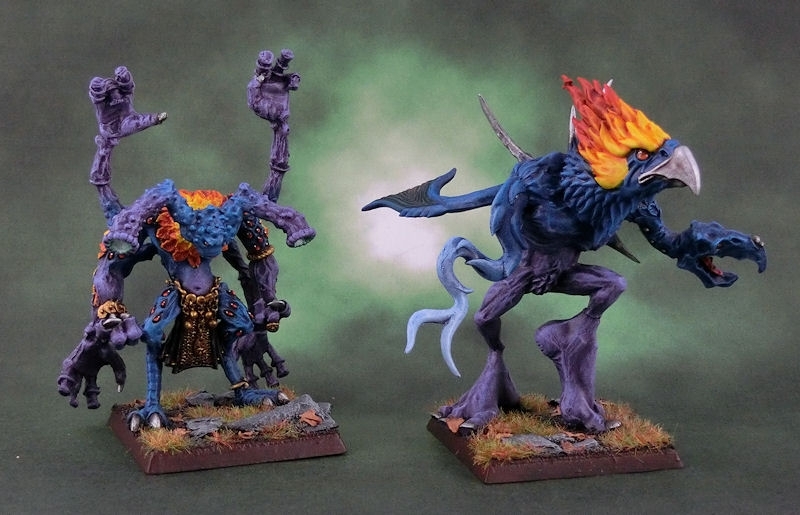 Despite his small size, he stands out enough from the other colourful followers of Tzeentch. Well, I've played a few games with the 1600pt army, and have come to realise that using a suicidally dangerous sorceror as the army general is rather too much of a risk, so I decided to paint up some extra characters to expand my options. First up was a Ral Partha (I think?) dragon that has been sitting on my shelves for 25 years or so. I added an old Marauder chaos warrior rider, plus a GW plastic cloak, demonic shield and extra arm - that's kind of the theme for my army.... champions and heroes have extra arms. Chaos Dragons are meant to be two-headed beasties, but I only had the one, and I really didn't want to just paint it dull old black. 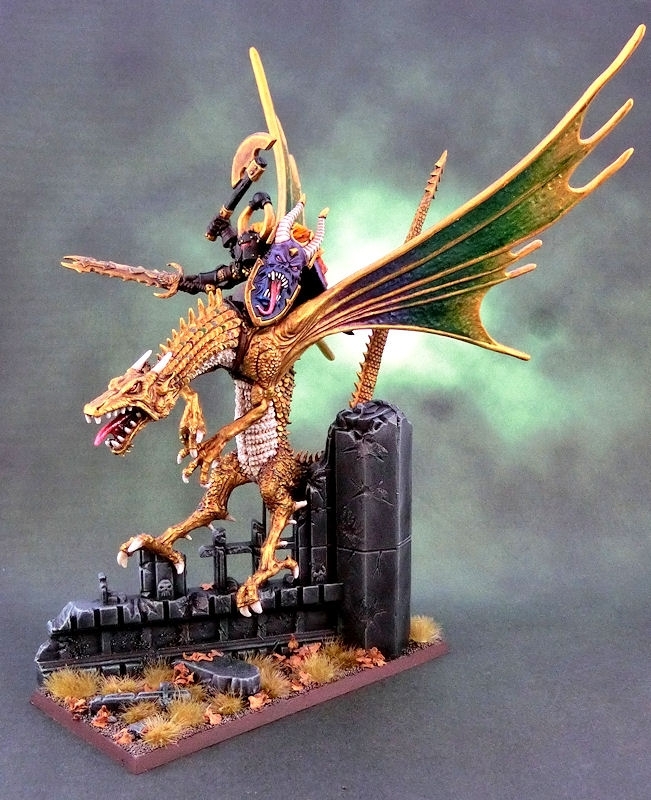 After all, the army has plenty of black already, and this dragon would be the mount for a follower of Tzeentch. So I decided to paint it a sparkling gold, with random scales of various hues (which you can't really see in this photo). The wings were painted in a gradient mix of very old GW metallic paints, to give a very iridescent bug-like effect. Finally, the whole thing was suspended with hidden pins above the ruins of an old chapel, to give the impression of the monster swooping down low on its enemies. To be honest, I don't think this model will ever get the chance to fight a proper fight in a real game, but it looks nice on the shelf! In my efforts to provide an alternative to my exploding sorceror in the chaos warrior unit, I pulled this ancient Tzeentch disc-rider model on to my paint desk. There are absolutely no conversions on this classic model, as I think it's perfect as it is. I duplicated the same black and gold armour colour scheme from the rest of the army, livened up considerably with a fiery helmet crest and that curious flamer-like lower body. His weapon plugs in to his backpack, and wouldn't look out of place in a 40K setting. Great model!! 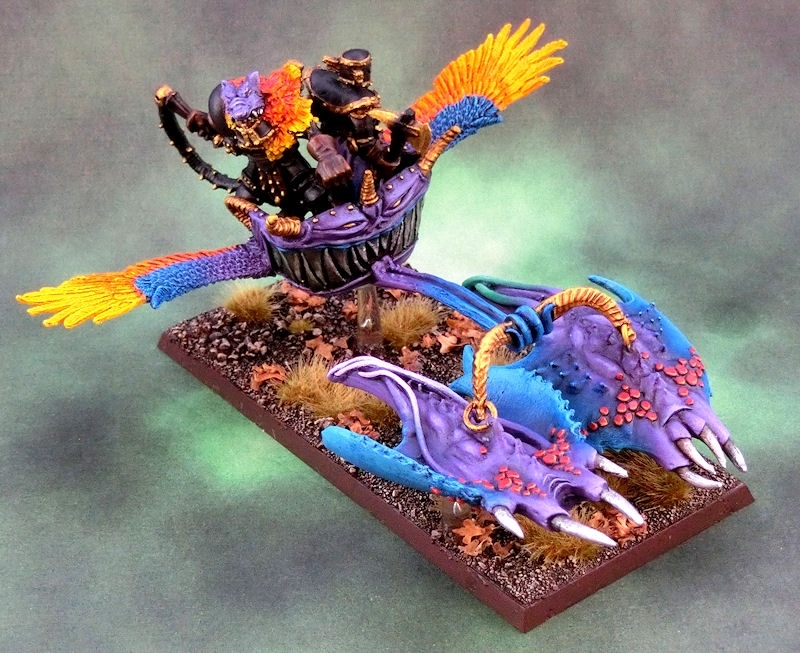 Finally for now was this rather complicated chariot of tzeentch conversion. The yolk and chariot body are pretty much the original classic model, although I had to widen the standing platform enough for two passengers. Then I chopped off the wheels and replaced them with colourful wings from an old giant eagle model. 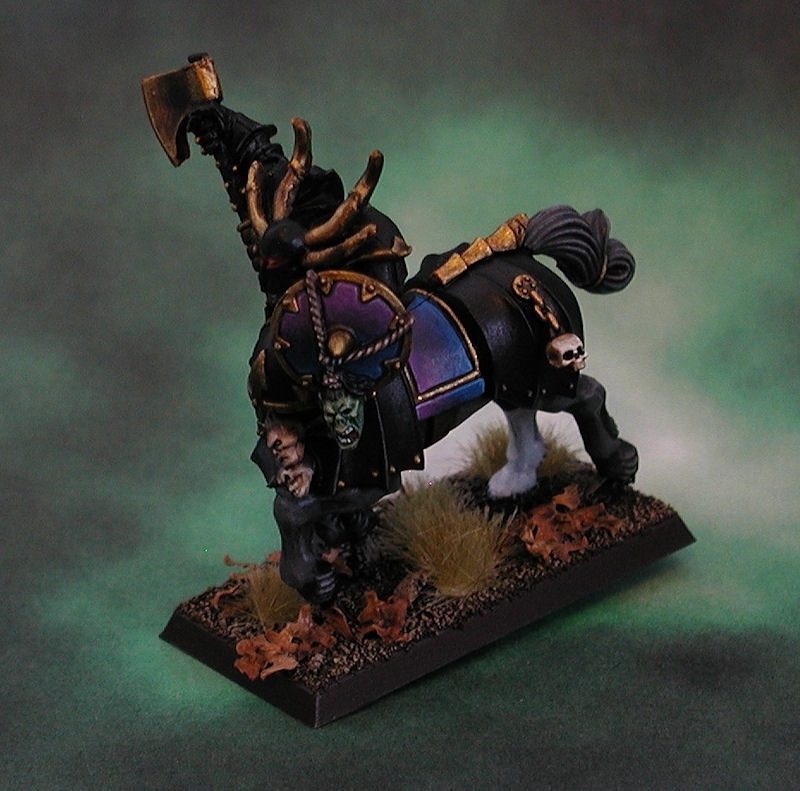 The passengers are also classic chaos warrior models, although the one with the whip actually used to be controlling two chaos hounds - that's why he has a warhound skull and fur on his helmet. Finally, I yolked the chariot to two modern screamer models with slightly truncated tails. Everything is raised on flying bases about 2cm above the base, which certainly gives it a Tzeentch-like appearance. It is also really heavy, as everything on the model is heavy metal! The colour scheme was just a mix of existing army colours, plus some extra shades of pink and green thrown in for good measure. I don't think that chariot's going to be sneaking around unnoticed!! My winter vacation was spent happily pulling old models apart and repurposing them as various units for my growing Tzeentch army. The main goal was to build this Daemon Prince, but I found enough extra parts and bodies to make two spawns and a hellcannon too! This is the Daemon Prince, made out of an old metal Greater Daemon of Tzeentch model. I kept the original head because I love the ancient feel to it, but swapped the small feathered wings for these enormous flaming wings from the high elf phoenix kit (that kit contains icy wings and fiery wings). Then I gently bent the arms to hold this Chaos knight halberd, and attached a lizardmen banner top and savage orc blade as the axe-head, and finished it off with a flaming tongue of fire - again from the phoenix kit. He's been pinned to some resin castle steps, so that nobody breaks his wings off by picking him up by those! 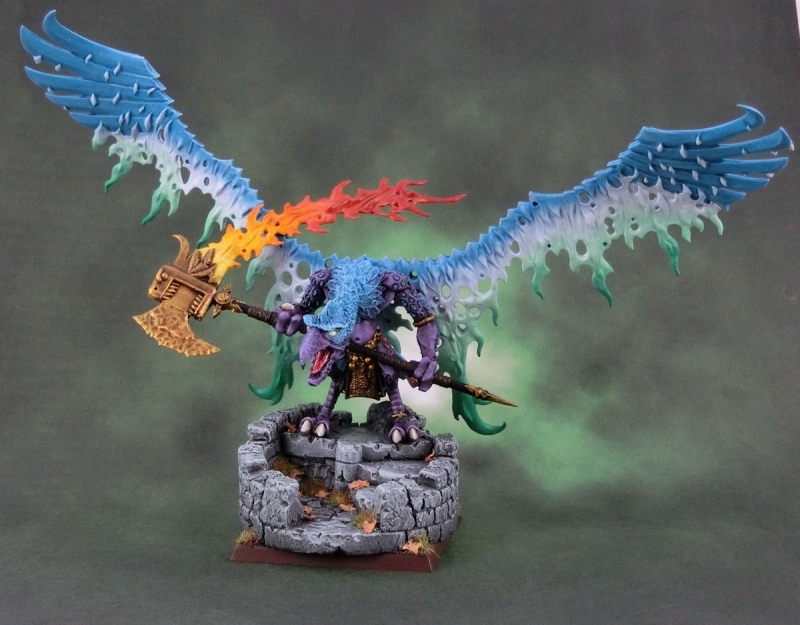 The colour-scheme called for something special, so in addition to the army-wide purple/blue blend and gold metals, I painted the flames on his wings as white to green fire - to give a magical feel to it. The more regular axe-fire was just painted in normal flame colours, which certainly makes for an obvious cannon target! That weapon will definitely be making an appearance as the Sword of Change, a chaos magic item allowing the Tzeentch daemon prince to change slain enemies into spawn! Perfect! 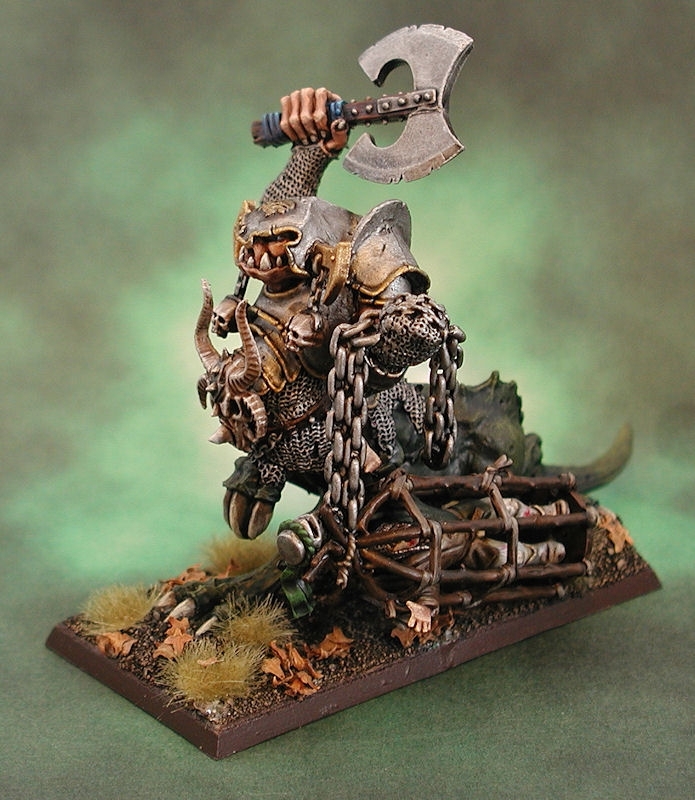 And just in case he succeeds in creating new Chaos spawn, I also build two of these guys from various bits-box parts. The spawn on the left uses the same Greater Daemon body as the Daemon Prince, but I've added 4 extra arms from old pink horror models, and 2 bubbling flamer arms. He also has an extra pink horror head on his back, so nobody is going to catch him unprepared! The spawn on the right uses the body from the chaos spawn kit, joined to a spare phoenix head, a spare greater daemon head for the left arm, a few random tails, spikes and tentacles, and two enormous feet - because I thought that looked funny! Finally, here's the last creation from my bits box - a Tzeentch-themed Hellcannon!! I didn't want to buy the GW-version of the hellcannon, so I used a spare phoenix head, two 40K barrels, some old 40K gun wheels, 40K building spikes and marauder banner tops to make this version of the daemon cannon. More spare parts from the high elf phoenix kit let me add magical flames shooting out of the cannon's mouth, and I also decided to add a fiery hatch to the top of the cannon, into which the crew can drop the skulls that feed the weapon. 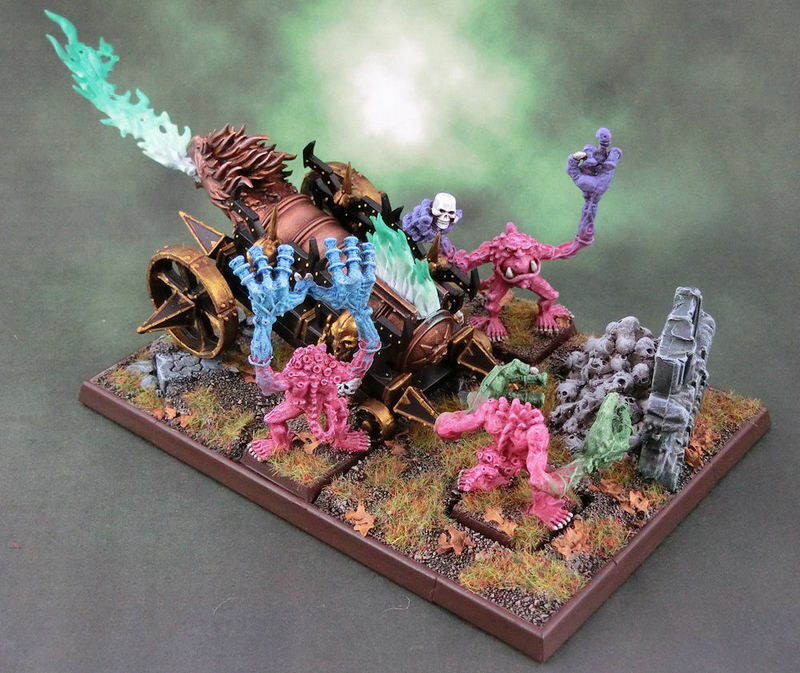 For crew, I used three old pink horror models because they suit the 'weirdness' of my army much more than chaos dwarves. An added bonus was that I was able to bend the metals arms in various poses. Bright pink horrors with multicoloured arms, and bright green flames shooting out of it certainly gets it noticed (and targeted!) on the battlefield. 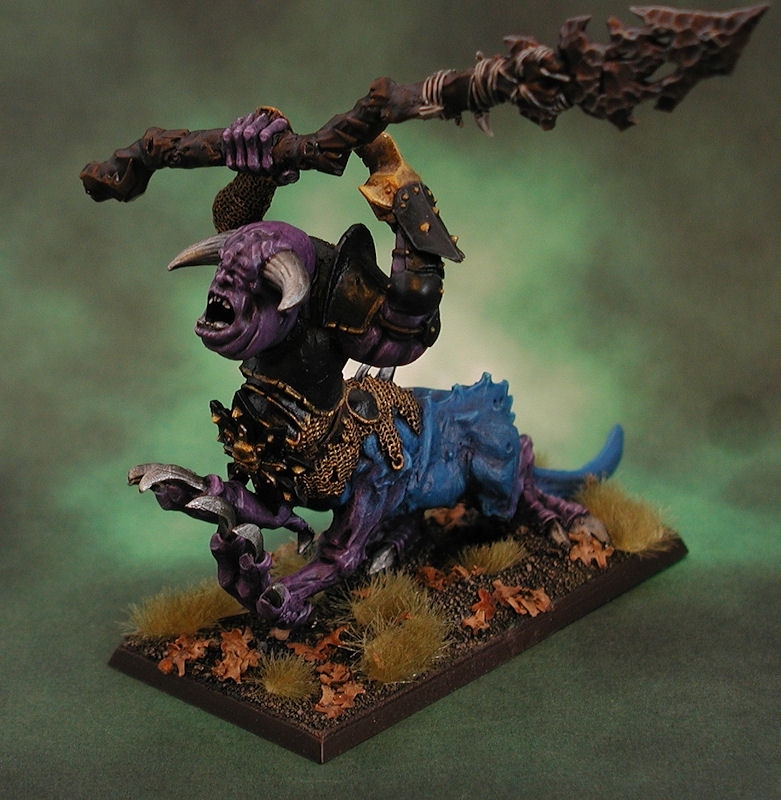 ▲ In the meantime, here are some classic metal minotaurs painted up to match the Tzeentch army colour scheme. Apart from a couple of weapon swaps, they are unconverted, and I absolutely LOVE THEM!! Tons of character in these old models. The champion (centre) was a little shorter than the others, so he got some extra blocks on his base to stand on! I finished these models off with a splattering of the new GW glossy blood paint. Unbelievably awesome. Can we get a full army shot? Cheers, Chris. I'm waiting on some new scenery to arrive before I take a proper photo of the full army in their natural habitat (well, the marauders, anyway)... viking longhouses! Thanks, Jean-Luc! I wish I knew where the foam wall piece came from, as they'd be perfect for other fast cavalry too! If there is one thing I hate more than plastic models it's when people mix plastic models into an army full of wonderful vintage metal minis. But you've done a better job than most, some of your creations are absolutely stunning. The chariot is my personal favorite, and your painting skills are amazing. Er.... thanks, I think? It was kind of a necessity, as I didn't have enough old metal models to make viable units. But I agree that they are WAY more fun than the current plastic warriors. Just wait 'til my all-metal marauder unit is done! At least the chariot is all-metal, I guess. Weighs a fair ton. Just a shame that it's so slow on the table, always missing out on the best action! This army looks so AWESOME! WOW! 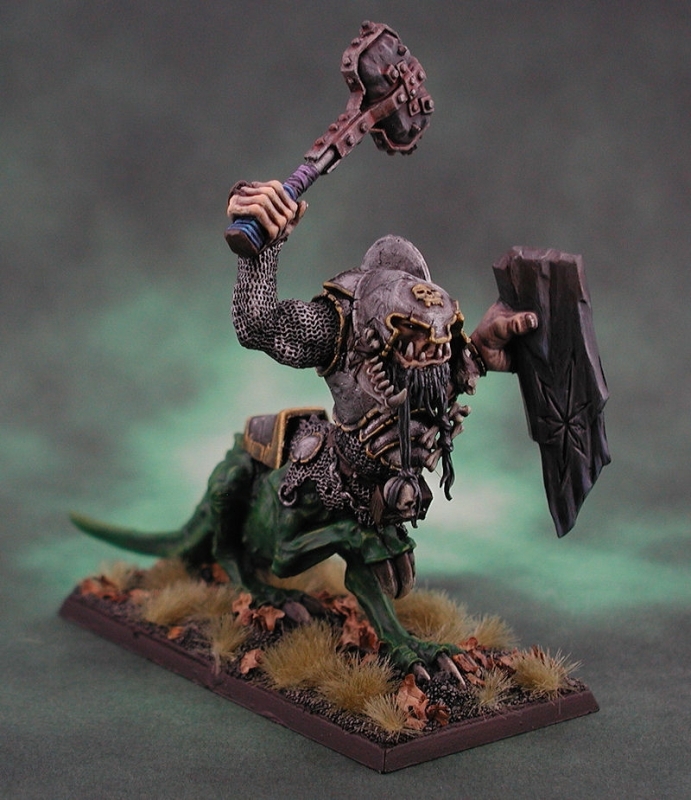 I love old school Citadel models, and I especially love all the conversions you did with the dragon ogres! So inspiring! I may steal your idea for putting a beard on the dragon ogre, for I have one too, and found your page looking for ideas to convert it. The face does look a bit scrunched up to me. I'll be subscribing and following your future work. Best wishes! 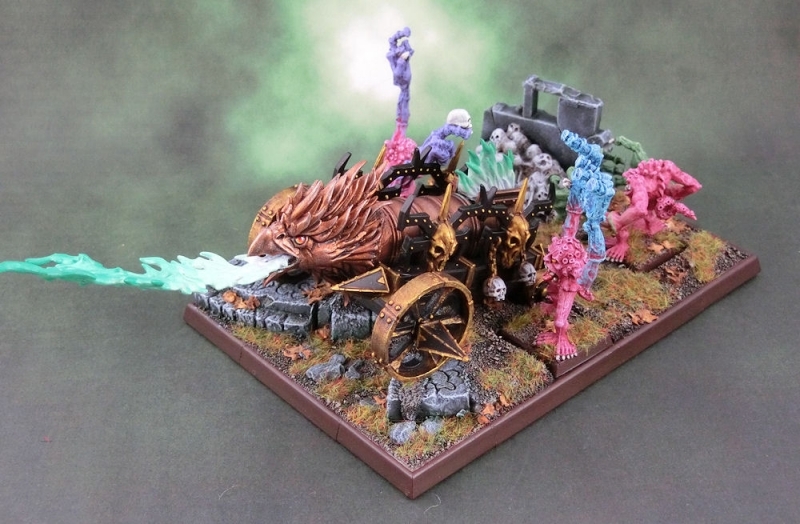 How is it going with your WhFb army? 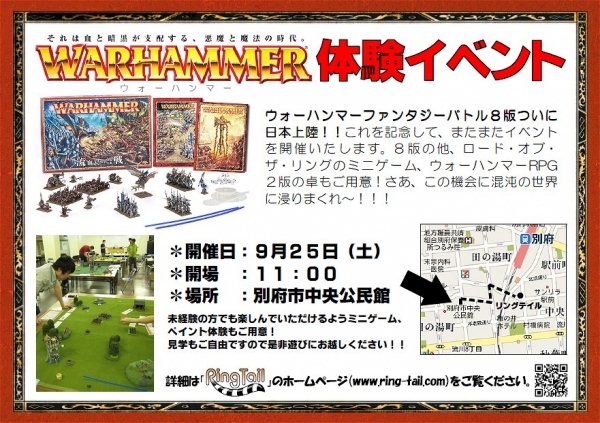 or with t9A? Er.... it's not going at all! They're sitting forlornly on a shelf, awaiting their turn in the sun again.